This is a continuation of the article, "Retaining ESL students." As I wrote in October 2017, "The concern among those serving international students is shifting from recruiting to retention. Student retention is especially critical at the college level, because there are many programs from which students can choose." To be ready for college, students need to have a variety of skills, behaviors and other characteristics. ESL students in particular face a variety of obstacles. Teachers and administrators need to monitor students and give them encouragement to keep them on track. Recent arrivals to the U.S. go through several stages of culture shock. The first stage is the “honeymoon stage” where everything is new and exciting. The next stage is the “hostile” stage as the newness wears off and the affected student becomes frustrated and angry and wishes to go back to the country of origin. The next period, recovery, is where the newcomer begins to adapt to the new language and culture. The final stage is adjustment when the person accepts the new culture as just another way of life. There are some things that administrators can do. Cooperation across departments is essential. As Karin Fischer wrote, "...international student advisers may need to collaborate more with other campus offices, such as career services, to make sure those offices are prepared to handle the special needs of foreign students…"
Students may drop out because they feel thatthey are not involved or that the material is just practice with no real life applications. A realistic activity set, "Project Based Learning," provides language learning through individual and group activities involving language content area, skills, and research where the focus is on the task rather than grammar. Working on real projects, such as oral presentations and articles for a campus newspaper, helps students develop interactional skills that may not be part of daily ESL/L2 classes. For example, they preview activities and have group discussions, listen to lectures, ask questions and work on their journals with each other. In meaning-driven classes, the focus is not on the grammatical points but rather on the content. Today’s students are interested in meaning-driven lessons. They are not just learning rules; they are learning an interesting topic. Necessary corrections can be included in the lessons as the students work towards accuracy in both written and spoken expression. Such an approach increases the learners’ sense of belonging and provides further encouragement for them to stay with the ESL program. Language input should be contextualized as much as possible so the learners can benefit from all the interactive linguistic elements, where students see and hear the new form as part of a larger unit rather than as a discrete point. When content becomes the centerpiece of a language course, English can be a means of acquiring new information rather than an object of study. Rather than just learning about grammar or words, the group members actually apply their language skills while completing the project. 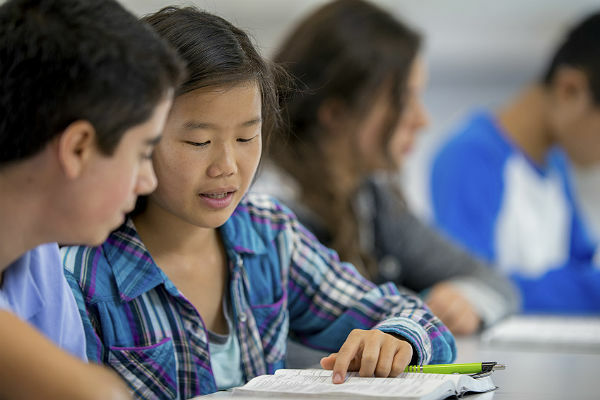 When explicit grammar instruction is called for, it should be presented in a topical interactive format where the various subskills of grammar, listening, reading, writing and cultural awareness all work together in the language acquisition process. Grammar is especially important to ensure communication, but the material presented should be meaningful and relevant to the learners' daily lives. A more modern approach to testing will help. Testing has shifted to a more learner-friendly communicative approach "…based on authentic uses of language, including portfolios, diaries, ethnographic projects, and documented interaction in language communities...."
Students are responsible for documenting their work in reports and self-assessments. Testing becomes more interactive. "This is, at their essence, what tests are intended to do. Tests ask students to look into their wells of knowledge, locate information, and express that knowledge on the page." Standardized tests measure the students sum total of knowledge at a particular point of time. Formative tests, on the other hand, seek to discover what students already know and what they need to learn as part of the overall teaching process. Formative assessments strengthen learning and a more efficient that just giving an end or term test that results in the students "cramming" and memorizing rules, which they soon forget. Formative testing at its best is low-stakes and high-frequency. When students are used to the practice of being tested (or "quizzed" if that term carries less baggage), it loses its emotional teeth and its utility as an educational tool begins to emerge. When teachers expose students to frequent low-stakes tests in order to reveal gaps and foster active, continuous engagement in the material, students are given more ownership and power over their education. Students retain the knowledge because it remains in their memory and allows them to make connections across disciplines. Students benefit from a common testing experience where no one can complain about an individual instructor’s tests being too hard. The best combination is a teacher-made final exam, writing sample and the common exit test. Involvement increases students' sense of belonging and inspires confidence. According to Fischer, "More than a third of the students surveyed singled out access to jobs and internships as one of the most effective ways to retain students." Students may feel discouraged as they struggle with academic English. Students face demands that are not covered in ESL classes and they need additional skills. Part of a student success strategy is encouraging students to think for themselves. "In particular, we need to teach students how to think for themselves." Learning is more than just compiling facts, grammar rules and vocabulary lists. Students are short of time to engage in authentic L2 learning activities. Students need to be active participants in the learning process. In other words, in order for students with a vast array of needs to master dense, rigorous curriculum and to demonstrate success on high-stakes assessments, they must have consistent opportunities to talk, read, and write about content-area concepts. This idea goes back to the original "spiral approach" where learners constantly review and add on to the knowledge. In addition they use all the means available to use L2 in a "total communication" approach. The communicative functions of reading, writing, listening,and speaking support each other. Students interact with each other, the texts and the instructors. They are actively learning the academic language that they will need when they enter the regular classroom. "My teacher... is my reader, my grader. Since she emphasizes on rules and limitations, she must grade according to these things. So I have to follow such rules. Then in such circumstances, I feel I did not dare to strike even a step; all around me were abysses-each step was full of danger. I felt I was restricted and I could not write any more. I felt upset and frustrated. I lost my desireness and confidence to write." Students are always on the lookout for a "better" ESL program. One must keep in mind is that they mean "different." Any problems that they may have will just go along with them to the new location. So the best strategy is to be proactive in providing incentives for the students to stay on in their current program. Help students with pronunciation and accent reduction since people often judge others by how they sound. "A recently published study shows that unless they speak in a confident tone of voice, you're less likely to believe someone who speaks with an accent. And, interestingly, as you make this decision different parts of your brain are activated, depending on whether you perceive the speaker to be from your own 'in-group' or from some type of 'out-group' (e.g., someone with a different linguistic or cultural background."